Products liability addresses the injuries and/or death suffered by one or more victims as a result of the defective design (i.e., negligence in the design), failure to properly test or inspect the product, and failure to properly warn the user(s) of dangers inherent with the product through the use of waning labels and instructions. And if a product is defective, the necessity of proving negligence may not be necessary to hold the manufacturer strictly liable for the defective product. In some instances, the victim may be able to obtain triple damages, attorneys fees and even punitive damages if the seller is found to have engaged in deceptive acts in selling the defective product to the public. And of course, products liability could involve anything from defective tires, defective heavy equipment, unsafe drugs, etc. Thus, if you believe you or your loved one may be a victim of a defective product, call us right away for a free consultation. 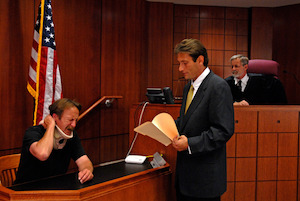 We will evaluate your case, and move forward on cases with merit. Call us today at: Trial Lawyers USA, LLC, (678) 882-7355.